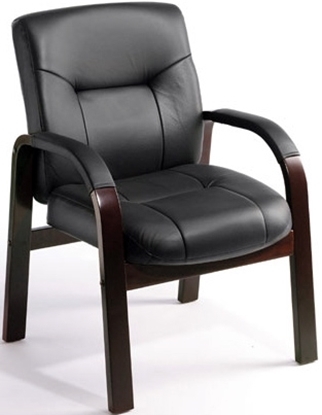 A stylish Leather Guest Chair, the Boss B8909 works well in a private office, conference room or waiting room. Covered in black Italian leather and featuring mahogany wood finished legs and arms. This chair combines good style and comfort at a very affordable price. Free shipping and warranty available on all office furniture. 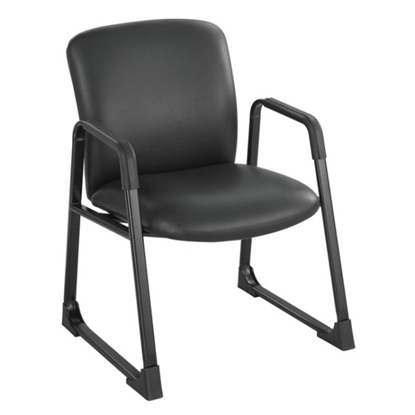 A sled based chair with a chrome frame, this guest chair is upholstered with ultra soft, durable and breathable Caressoft Plus. 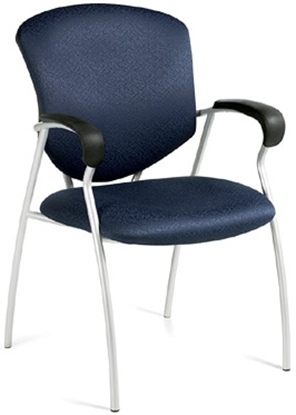 This model serves multiple purposes, great for use in waiting rooms and conference rooms. 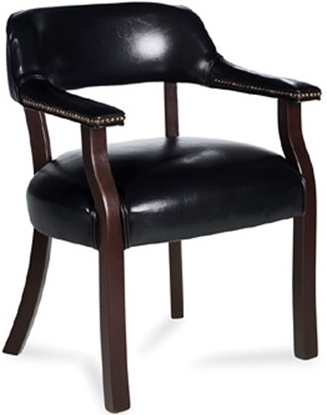 From our large collection of guest chairs, this Arno sled base leather guest chair is one of our best. From its impact resistant arms to its sled base for easy movement, to its comfortable leather covered back and seat, it is a great choice. This model is also eco-friendly GreenGuard® certified. Includes free shipping and full warranty. 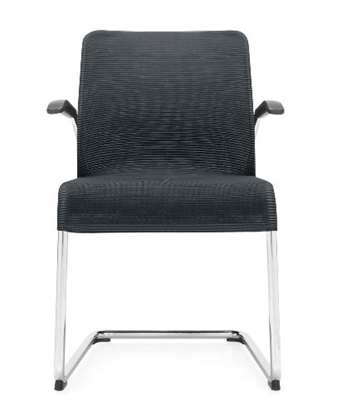 The Supra is a stylish guest office chair with ergonomic features. Perfect for guests in a reception area, multi purpose room or office conference room. Featured in three different contemporary fabric choices; Black, Graphite and Sapphire. 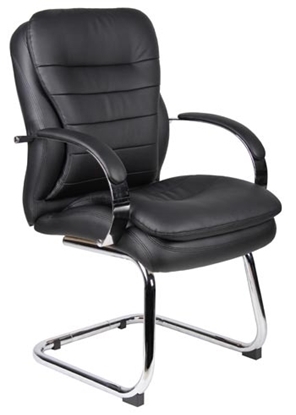 Free shipping and full warranty available on all discount office chairs. 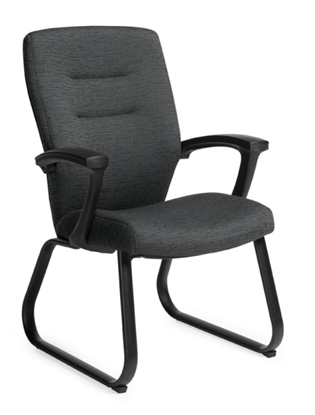 A contemporary guest office chair, the Max 5382 is generous in size and presents a good image. 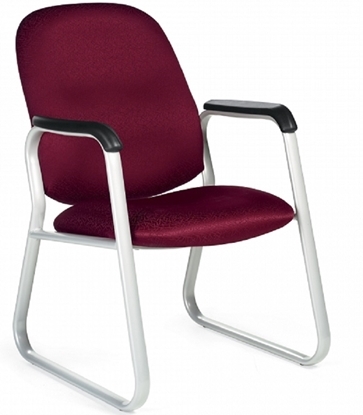 Its multipurpose design makes it ideal for waiting rooms or in front of an executive desk. The Lenox is a solid hardwood constructed guest office chair that assembles with ease. 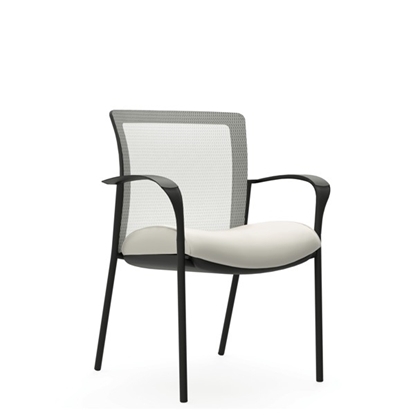 This chair is designed for a modern waiting room, guest area or conference room. Available in a wide variety of colors and finish styles to match almost any room decor. 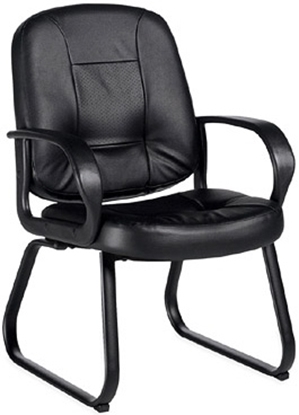 Warranty and free shipping on all discount office chairs. A great solution to any office seating needs, this mesh guest chair can stack 4 high for easy storage and would make a great addition to any private office or multi-purpose where extra seating may be needed. Lesro's Mystic Series armless guest office chair features sophisticated and contemporary styling, enhanced comfort and eco-friendly soy based foam. A refined combination of metal and fabric make this series ideal for your waiting room. 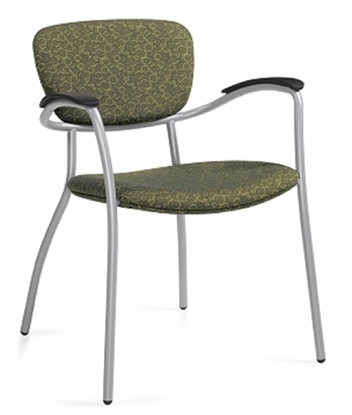 The S1802G7 is a great choice for medical offices and reception areas. Allow your guests to sit comfortably while waiting or in meets in this Big and Tall Guest Chair. This chair features a 500lbs. capacity and is upholstered in easy to clean Black Vinyl. A sled based guest office chair created by renowned designer Zooey Chu. The Synopsis 5092 is constructed with a compound curved back which adds a distinct look while maximizing comfort. Great for waiting rooms or conference room seating. Order today and get free shipping! The sled is back in an elegant update of a classic. Global's new Lite seating series blends refined metal work with a beautiful ribbed mesh covering in an array of contemporary neutrals and chromatic hues. This Global guest office chair combines classic styling with contemporary comfort. Quality craftsmanship provides a sense of elegance to your executive office or home. Features a solid wood frame, durable vinyl seat and brass nail head trim. This model is eco friendly GreenGuard® certified. Full warranty and free shipping on all discount office chairs. 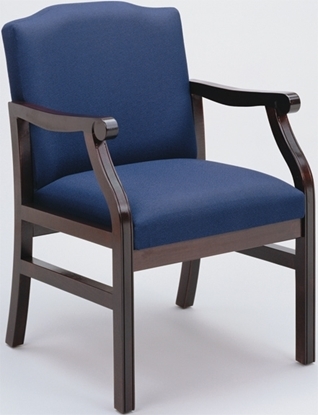 A sophisticated and solid hardwood guest chair, the Weston is ideal for a waiting rooms or office guest areas. This chair is easy to assemble, available in a variety of fabrics and finishes. Create your own sense of style with many different color combinations. Get a full warranty and free shipping on all discount furniture. 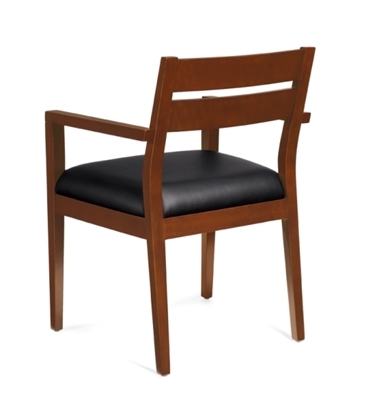 The Madison is a solid hardwood, traditionally styled guest chair from our waiting room furniture collection. 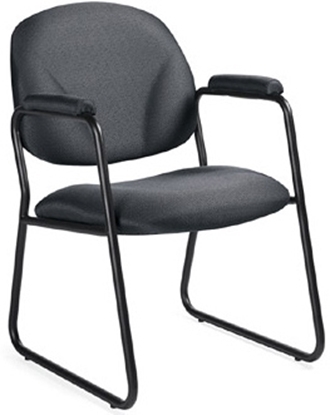 This chair works well in a reception area, business or medical office setting. Easy to assemble, this model is available in a number of fabrics and finishes. Warranty and free shipping available. The sled is back in an elegant update of a classic. Global's Lite seating series blends refined metal work with a beautiful ribbed mesh covering in this chair cantilevered frame with cantilevered arms. Order today and get free shipping on all guest office seating!